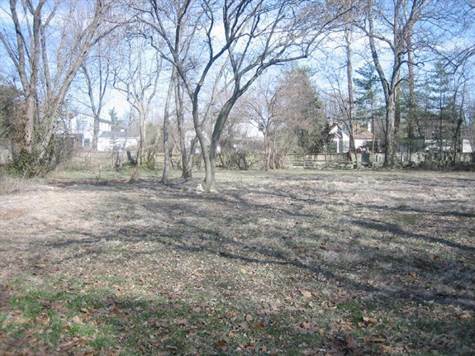 Kirkwood, St. Louis County - Build your dream home on a huge +/- 1/2 acre (150x150) private, wooded lot on the Oakland/Glendale border. Home was torn down by developer who had plans for a million+ home before bank took possession. Land parcels of this size are very rare & typically sell for $250K-$400K. Property is competitively priced as there are a few challenges to overcome before building. A sewer easement runs through property. MSD will require it to be re-routed with manholes for storm water. (documents attached). MSD may also require a revised study as a creek runs along the rear of the property. The creek has overflowed its banks during heavy rains in the past(not in recent years) though storm sewer improvements may have resolved most problems. (See attached documents). Possible that Okland may only allow a crawl space, above ground foundation, or slab. However such a large parcel allows for a carriage style garage with upper storage and/or walk-up attic design. At this price you can be very creative!